Do you remember, not too terribly long ago, that mixing stripes and plaids was a big fat NO-NO? I’m sooo glad times have changed. 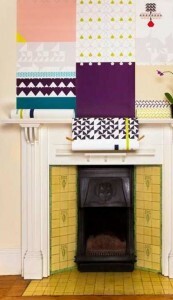 Decorating with patterns is a fun and fabulous way to add more and more pizazz to a room. Now, I will admit, this style of decorating can be a bit tricky; it’s not really an “anything goes” kind of deal. There can be some misses with your hits. Let’s start simple. 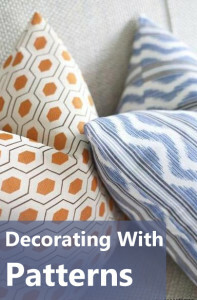 Let’s choose pillows to practice your layering. You can do this in a store and not have to buy a thing. Just for fun. 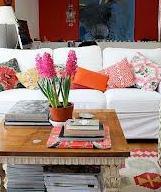 Arrange some pillows on the floor or better yet a nearby chair or bench. Once you have something you feel comfortable with and like, take a picture of it for future reference and decide if it’s a hit or a miss. This will get easier with practice, I promise. First, choose your colors. Delete the ones from your selections that don’t seem to get along with the other colors. What you ultimately want are different shades of the same color (to start with). Red-different shades and hues; Blue, same thing, etc. And you want to look for different shapes working in different directions. Add a contrasting color. Once you have your main color chosen, add a bit of contrast. Say your main color is blue, try adding an element of yellow or orange. Choose patterns with differing scale. Some large, some medium, and some small. 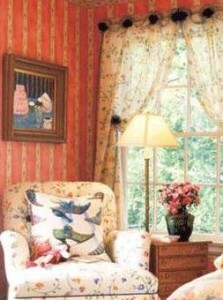 Try not to use more than one size pattern in a close setting (like pillows). More than one element of the same scale tends to look like you tried and missed. There are some fabulous designers that have this down to an art, but those of us novices….well we better start easy. 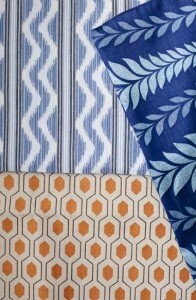 If you have a fabric that you are in love with, especially if it’s a large scale, don’t choose another large scale pattern for it to fight with. The complete picture: a small geometric pattern, a medium fluid pattern, and a large floral pattern; or any variation of the above. Ideally, each of these patterns would run in a different direction. Now, notice I said the “complete picture”, not the only picture. There are thousands upon thousands of colors, patterns, and textures to choose from. These are decorator’s guidelines and we all know that our inner decorator is the boss! Have fun and love your result!